In celebration of the 200th anniversary of traditional Oktoberfest, MGM MACAU is hosting Oktoberfest in cooperation with Macau Government Tourist Office (MGTO), German Consulate General (HK & Macau) and German-Macau Business Association (GMBA) from Oct. 15 till 23, 2010. All visitors and local residents can experience this 9-day long German fiesta filled with genuine Paulaner beer, hearty German food, wine and live popular band flown directly from Munich . 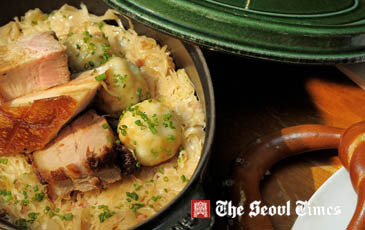 The pre-event press conference was held on September 28 at The VISTA of MGM MACAU, where guests and media have prelude access to Oktoberfest Paulaner beer, sizzling bratwurst and sausages, traditional German benches and costumes. German Consul General in Hong Kong & Macau Mr. Werner Lauk, Director of Macau Government Tourist Office Eng. 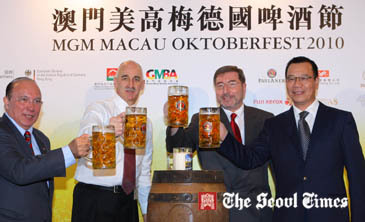 Joao Antunes, president of MGM MACAU, Mr. Grant R. Bowie, and chairman of German-Macau Business Association, Mr. Tony Un, together officiated the ceremony by tapping a traditional Oktoberfest beer keg.